Our recent trip to Africa was the first time I had seen wild animals up close in their natural habitat, unrestricted by fences or moats, or really anything at all. Africa is a truly amazing continent, and if it isn’t on your bucket list, it should be immediately. You see, it wasn’t on mine. But now that I’ve been there, I absolutely cannot wait to go back. You can safari in many countries in Africa, and I’m sure you will have an amazing experience everywhere, but we picked Tanzania for this trip. My mother grew up in Tanzania and wanted us to experience some of her most memorable experiences, and create new memories of our own. Let’s just say she definitely succeeded in her mission. We worked with a travel agent to put this trip together - something I highly recommend. This is not a trip you should attempt to plan on your own. Our travel agent worked with Leopard Tours - one of the largest safari operators in Tanzania. We had a private vehicle with just the four of us - a Toyota Landcruiser. While there was room for more people, I don’t recommend having any more than 4 people on the tour since everyone is moving around and trying to see wildlife with binoculars and take pictures, and more than 4 people would start to feel very crowded. Our safari vehicle. We safari’d with Leopard Tours, Tanzania’s largest tour company. The top of the safari vehicle pops up so you can safely view and take pictures of the animals. Nick and I flew South African Airways out of JFK to Johannesburg, connecting to Nairobi Kenya where we met up with my parents. After a good night’s rest, we set off early in the morning for a flight to Kilimanjaro (yes THE Kilimanjaro) where we were met by our driver and tour guide from Leopard Tours who would accompany us for the next 6 days. Once we landed in Kilimanjaro, it was a 5+ hour drive to our first stop: Ngorongoro Conservation Area. Ngorongoro is a deep volcanic crater, about 20 kms across in diameter. The crater is home to all kinds of animals - herbivores and carnivores alike. There are no barriers other than the natural ones, so some animals can and do leave, but once you’re in there you can see why a lot of the animals choose to stay there - there’s plenty of food and water, and probably no inclination to leave. We saw animals as soon as we descended into the crater. 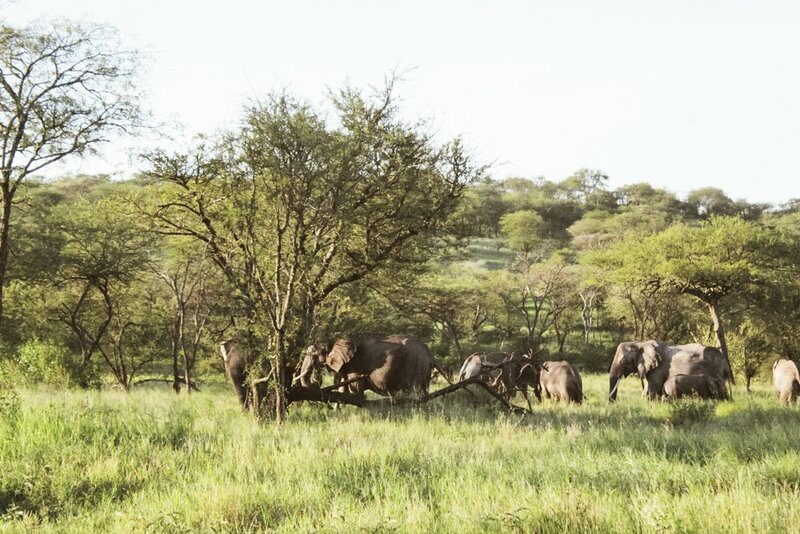 Buffalo, zebra, wildebeests, warthogs, they were all right there!! So many zebras everywhere! And they are so beautiful up close. Our first carnivore sighting was a medium sized cat called a caracal. The caracal was a rare sight - they tend to hunt at night, but we saw one right there in the open. As we saw it crouch, Nick and I both grabbed our binoculars to be rewarded with the sight of the caracal swatting a bird out of the air and eating it. I had David Attenborogh’s voice ringing in my head. Next up, a pool of hippos. Did you know that hippos don’t have sweat glands so they have to spend all day in pools, and only come out of them at night? And just as we were pulling away from the hippos, our guide got a call on the radio - a pride of young lions was within sight!!! 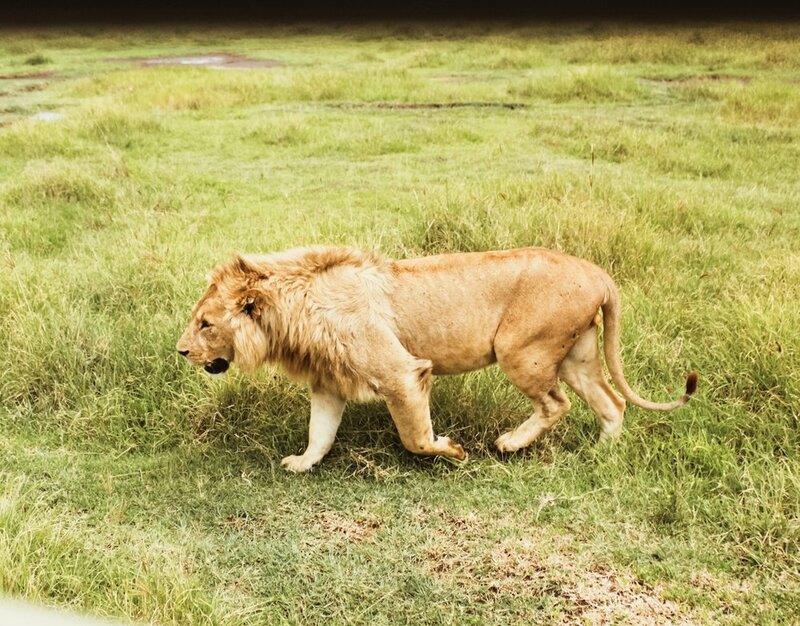 As we got closer, one of the lions half heartedly chased a warthog, and the whole pride decided to walk right past us. A number of trucks had gathered by this point, cameras clicking away, and the lions just sauntered by, completely unconcerned. A pride of lions walked right past our car. This picture is taken with no zoom. Some of them got so close that I could have easily reached out and touched them. Fun fact: Lions = simba in Swahili. JUST LIKE THE LION KING!!!! The rest of the day at Ngorongoro was just as magical - gazelles, ostrich, cranes, jackals, baboons and flamingos just walking around. We saw a rhino in the distance but it was really far away - they tend to not get too close to the humans (unlike the lions and zebras). And then on our way out, we had a crazy encounter with a young male elephant, who just walked out from behind some trees and crossed the street in front of our truck. Apparently he didn’t like the sound of the engine because he stomped the ground with his feet and looked like he was about to charge us. Our guide turned off the truck, and the elephant, being reassured gave one last snort and walked away. After breakfast the next day, we made our way over to Serengeti National Park, a 4+ hour drive. Yes, THE Serengeti. I had initially put my camera away, but realized this was the wrong move, because we saw our very first giraffe on the drive! There were so many animals everywhere - zebra, impala, wildebeests as far as the eye could see, all the way to the horizon. I’ve never seen so many animals in one place like that - in fact, I don’t think I’ve ever seen so many people in one place, except maybe the CAVS parade. It was also really interesting to see the Masai people living in their traditional homes, called Bombas. They used to hunt wild game, but most of the Masai we saw were goatherds or ranchers, although some even had camels. We arrived at our hotel around lunchtime and after a quick lunch and rest, we headed back out for a short safari drive around 4 pm. All the parks close at 6 pm — the night time is hunting time for the carnivores, and because the roads are actually just dirt paths, it is dangerous to be out in the parks after night. One flat tire (we saw many) and you could be dinner. Turns out, 4 pm was a great time to go out - we saw more hippos, giraffes and baboons. But the most impressive thing we saw was a herd of elephants, including some that walked across the “road” right behind our truck! You can smell elephants before you see them. This herd was pretty large, and the older elephants were keeping the babies in check. Some of them walked right behind our truck! My first hot air balloon ride didn’t disappoint. Sunrise over the Serengeti was truly magical, and the ride was followed by a champagne toast and a full English breakfast on the banks of a river under an acacia tree. Casual. 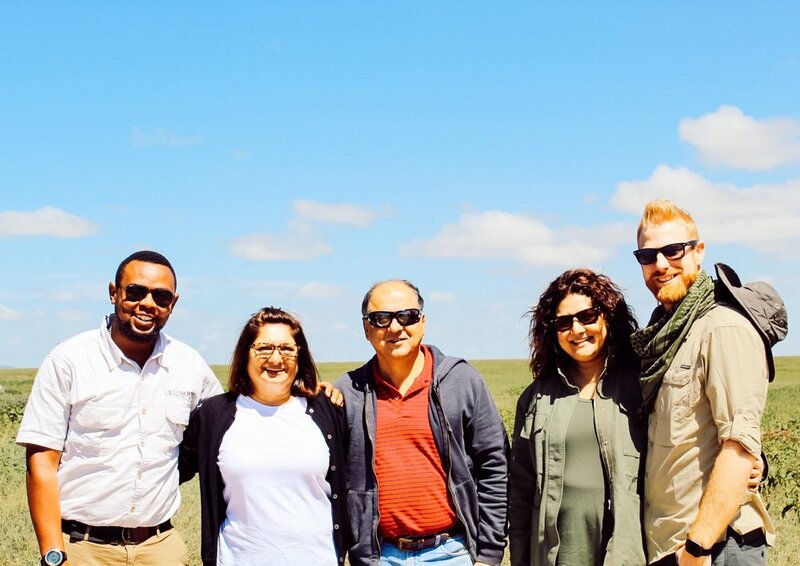 The hot air balloon ride was truly a once-in-a-lifetime experience, and although we were tired with the early start, we were instantly alert as we set out on safari. Our day in the Serengeti was truly amazing - beyond the herbivores I’ve mentioned previously, we came across two truly amazing sights. The first was a trio of young lions, resting under a tree after feasting on a buffalo they had recently killed. They sat a few hundred yards from the prey - close enough to keep an eye out for hyenas (there were a few nearby) and other animals who might want to steal their precious dinner. The lions were very full and sleepy. The second was our encounter with an equally full cheetah! We didn’t see what this cheetah killed, but it was laying in the sun, refusing to move. Well-fed cheetah. Our guide told us that the cheetah like to jump up on the trucks to get a better look at prey. One of the people we met at the lodge had this happen to him, and he had the pictures to prove it. We were not that lucky, but it was still pretty cool to be this close. They look like grey blobs but if you look closely you can see ears, eyes and snouts. The next day we drove Lake Manyara for our final stop on safari. Lake Manyara is the smallest national park, and is mainly known for its bird watching. To be honest, I really don’t care about birds at all, so it held little interest for me with the exception of the baboons and giraffes, although no where near in the same quantity as we witnessed in Serengeti. My mother has distinct memories of leopards hanging out in the trees, but these days unfortunately the lake area is overrun with invasive grasses, so it’s really hard to see a lot of the park that used to be open and visible. Can we just agree that giraffes are super weird looking? They a bit like really tall cows - we would just come upon them, chewing on leaves and grass, completely unfazed that we had pulled up to stare. Overall, a safari in Tanzania is a truly magical experience - one that I want to do again already!!!! If this isn’t on your bucket list, you should add it immediately! If you’d like our itinerary, keep scrolling to the bottom of this post! With my parents and Peter, our driver and tour guide from Leopard Tours. Day 5 Lake Manyara: Following breakfast at Seregeti Sopa Lodge, drive to Lake Manyara (approx. 4 hrs drive). Lunch at Kirurumu Manyara Lodge. Afternoon game drive at Lake Manyara National Park. Dinner and overnight at Kirurumu Manyara Lodge. Our trip was originally supposed to Lake Manyara - Seregeti - Ngorongoro, but had to be rearranged to account for hotel availability. As a result, Lake Manyara seemed a little underwhelming after both Ngorongoro and Serengeti. 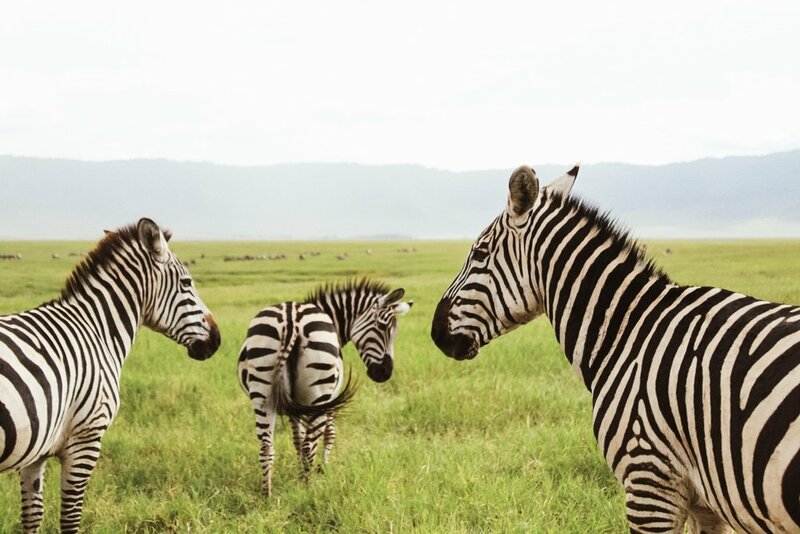 If you’re following our itinerary, definitely do Lake Manyara first, or swap it out Tarangire National Park. We didn’t go to Tarangire but met people at the lodges who absolutely loved it. Pin this post using the image below! Older PostCAPSULE THREE is here!